MAKEUP BRUSH CLEANER: will help thoroughly clean through all the bristles and make cleaning your brushes. 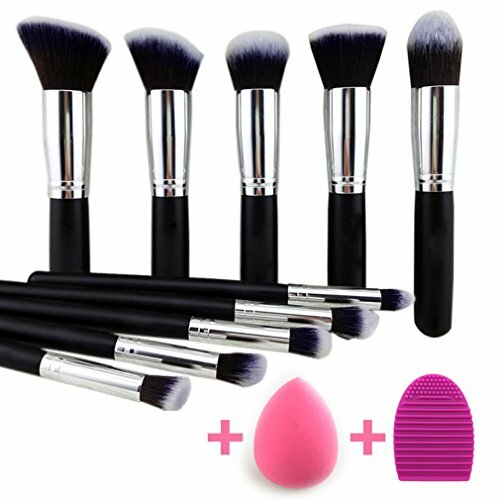 Set contains: 10pcs Makeup Brushes + 1pc Makeup Sponge + 1pc Brush Cleaner Pls rest assured purchase. Amazon is responsible for delivering,Faster and more safety to meet your needs.◆ COMPLETE SET OF ESSENTIAL MAKEUP BRUSHES FOR PROFESSIONAL USE OR HOME USE. Perfect makeup kit for liquids, powders, or creams to produce a beautiful face and eye makeup application. ◆ EASILY PORTABLE and EASY TO USE BRUSHES FOR MAKEUP WHEREVER YOU ARE. Pls choose BEAKEY shop to enjoy attractive package (individually wrapped along with a plastic bag), and the free superior makeup blender sponge and brushes washing egg.